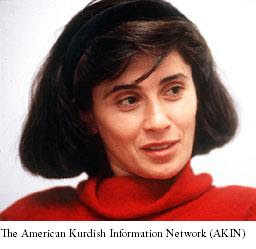 Leyla Zana now a symbol of Kurdish patriotism was born in 1961 in Silvan, Kurdistan. Her wish to breathe freedom and live in a fair society created her love and commitment to politics and the Kurdish cause as early as age fourteen, when her husband Mehdi Zana was detained for three years after his campaign for the Communist Party of Turkey. Leyla, pregnant with her first child she was left helpless when Mehdi, the former mayor of Amed was arrested. Struggling for visitation rights many time she forbidden to even see Mehdi. As a result, it led to her first arrest in 1988 after her and a group of people rioted against the Turkish soldiers for torturing the imprisoned men they wanted to visit. She was tormented and treated with cruelty for the 57 days she was in prison. “I take this oath for the brotherhood between the Turkish people and the Kurdish people." The above statement left the members of the Turkish Parliament and government furious and shocked calling Leyla a separatist and a rebel. Turkey for years and years has robbed the Kurdish citizens of basic human rights such as freedom of speech or expression, political affiliation, and freedom of identity. Therefore, their reaction to her representation and pride in the Kurdish flag, her identity, and the statement she made in her native language (Kurdish) in the parliament was anything but positive. She was accused of treason and prosecutors passed the verdict by sentencing her to 15 years in prison. In 1994 Leyla joined the many other Kurdish activists in prison who have been convicted for wanting basic humanitarian rights. Her arrest gained the attention of the international community and an incredible number of supporters joined to condemn the actions against her, such advocates included even members of the U.S. Congress. A year after her sentencing, in 1995 Leyla was nominated and won a Nobel Peace Prize for her courage and will to create a peaceful environment between Kurds and other nationalities. During her years in prison she was also awarded with other peace awards, including the Sakharov Prize and Bruno Kreisky Award. In 1998 she was nominated a second time for a Nobel Peace Prize. Not only did she gain respect globally for her nobility, character, and courage she most importantly helped many Kurds in particularly women to choose and shape their lives independently and break the norms by dedicate their lives to themselves and their nation. On June 9, 2004 ten years after unreasonable jail time in the Turkish cells Leyla was finally released by order of a Turkish appeals court along with three other parliamentarians. Currently her husband Mehdi Zana, along with their son and daughter Ronayi and Ruken live in exile in Europe. Meanwhile, Leyla is staying strong and very active by continuing her fight for peace and democracy. Despite all of this, on April of 2008 she was sentenced to two years of imprisonment by a Turkish Court after giving a speech at a Kurdish Newroz festival and naming three of the prominent Kurdish leaders. The necessity for basic human rights for herself and her fellow Kurds were motives that persuaded Leyla to fight and become a strong female activist in the Kurdish struggle. Her active role in politics has had an enormous affect on Kurdish souls and she has awakened many Kurds to continue the fight and keep the fire burning and the Kurdish pride alive. Kürkçü , Ertugrul . "Defiance Under Fire." Amnesty Magazine 2003 15 Jun 2008 .